If you are familiar with the traditional indexes of TV usage, measured in hours per day of use, you might be struck by the similar role mobile apps and web access now play. Across a wide range of countries, daily engagement with mobile apps and web ranges between three and four hours each day, for customers who have access to the Internet from their phones. In Brazil, engagement is about 4.5 hours each day. 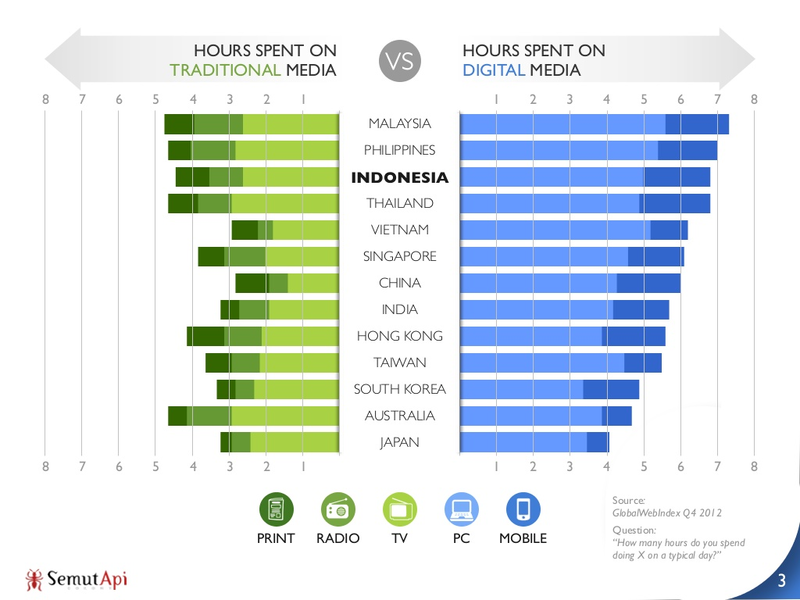 In Malaysia, engagement lasts nearly four hours per day, with users in Thailand, Indonesia and the Philippines not far behind. In India, daily mobile Internet use occupies nearly 3.5 hours. Basically, people in many nations now spend more time interacting with mobile online content than they do watching television. That is one major reason why most observers expect a continued migration of advertiser spending to mobile media. Eventually, advertisers go "where the eyeballs are," or where the consumer attention exists. Without question, digital platforms now already has become the dominant media platform in many countries in Asia. Depending on how one measures usage, mobile engagement is either smaller or larger than time spent watching TV.